Prime Minister and FijiFirst Leader Voreqe Bainimarama has stressed that he and NFP Leader Professor Biman Prasad will never be the same and he hates being in the same room as Biman Prasad. While speaking at the FijiFirst Family Fun Day in Labasa, Bainimarama says that the National Federation Party’s strategies are a joke. 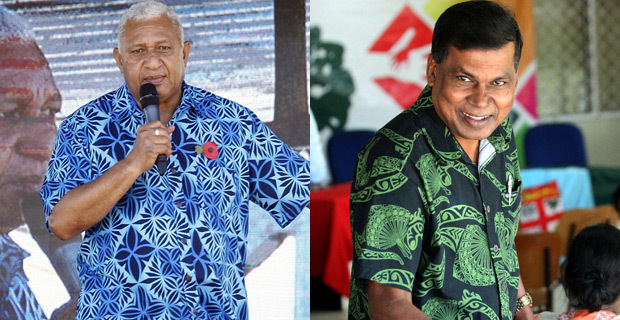 Bainimarama also highlighted that NFP President Pio Tikoduadua along with Professor Biman Prasad try to compare themselves to him and FijiFirst General Secretary and Attorney General Aiyaz Sayed‑Khaiyum. Bainimarama also touched on the NFP’s manifesto that has listed that it will reduce unnecessary overseas trips for meetings as they hated the fact the he held the Presidency of COP23 adding that none of them will come close to even smelling this position. He says NFP also wants the Prime Minister going by bus instead of using his own vehicle. Bainimarama also highlighted that the NFP’s initiatives within their manifesto is the same lies used by the Labour Party adding that this is a joke. Bainimarama says that the Presidency of COP23, Co‑Chairing the World’s first ever Oceans Conference and Fiji being elected into the United Nations Human Rights Council are some of the achievements that the NFP are childish enough to want to cut off.